Can a Pension Beneficiary Be Changed With a Power of Attorney? 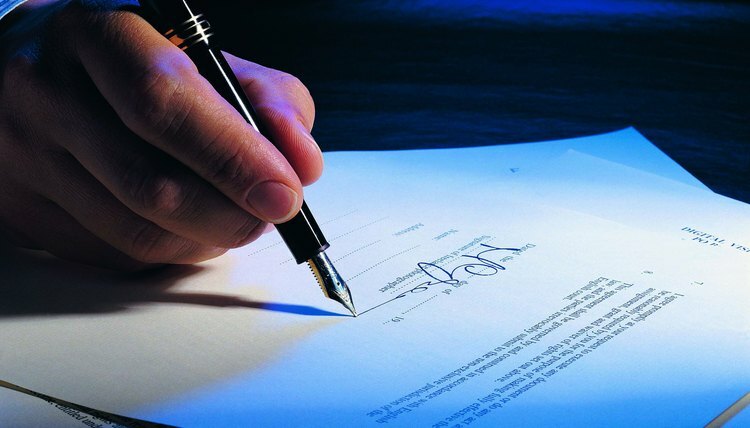 A power of attorney is a legal document that allows you to grant someone else the right to act on your behalf. The person you authorize to act on your behalf is called your agent. State law regulates powers of attorney. While an agent can have the authority to change pension beneficiaries with a power of attorney, the exact language needed within the document varies by state. The idea of a power of attorney is that you can give someone else the authority to step into your shoes and legally act for you. The range of acts that can be handed off is extensive and includes allowing your agent to handle your bank accounts, manage your investments or operate your business. These types of actions are considered general powers and can be granted with a general statement included in the document that states your agent has the power to perform all acts you can do. Changing a pension beneficiary is typically not considered to be a general power. Some actions are considered to have a high risk of fraud or misuse. They are sometimes called "hot powers." These include giving gifts, changing beneficiary designations, creating or modifying a trust, or delegating authority granted under a power of attorney. Special language must appear in the document before an agent can take these actions. States often require specific authority before a power of attorney can grant the right to change a pension beneficiary. The language needed to convey the power to change a pension beneficiary varies by state. For example, the Uniform Power of Attorney Act, enacted in 13 states and U.S. Virgin Islands, requires that the power of attorney document specifically grant the ability to "create or change a beneficiary designation." The Act further says that even if you try to grant this power, your agent can't change the beneficiary to himself or his dependents unless he is your ancestor, spouse or descendant. Pennsylvania, on the other hand, requires only the more general language "to engage in retirement plan transactions" and places no restrictions on whom the agent can name as beneficiary. Your agent can't actually get the pension beneficiary changed until the pension plan's administrator accepts his authority under the power of attorney to make the change. The company BP, for example, will accept a power of attorney for beneficiary changes as long as the power of attorney is in the form BP provides. The New York State and Local Retirement System accepts powers of attorney to change pension beneficiaries if the power is specifically granted, but also accepts the document without special language if the agent is the spouse, parent, child, grandchild or sibling of the pension owner. If the plan administrator refuses to make the beneficiary change, check with an attorney to find out what you can do. Some states provide an option for legal action if a plan administrator improperly refuses to honor a power of attorney document. Can a Power of Attorney Change Beneficiaries on Bank Accounts? New York State and Local Retirement System: Life Changes: Why Should I Designate a Beneficiary? Can POA Supercede Spousal Rights? Can I Give Someone a Power of Attorney to Cash My SS Check?